Michael Pedro gives an overview of the techniques he uses to achieve high-quality 3D concept designs, with an emphasis on production-setting workflows. He begins by going over shape ideation in Alchemy and then develops a full page of thumbnails. Michael then proceeds into ZBrush to begin blocking in the major forms and bounces between ZBrush and Photoshop, sketching over screenshots of the in-progress sculpt. 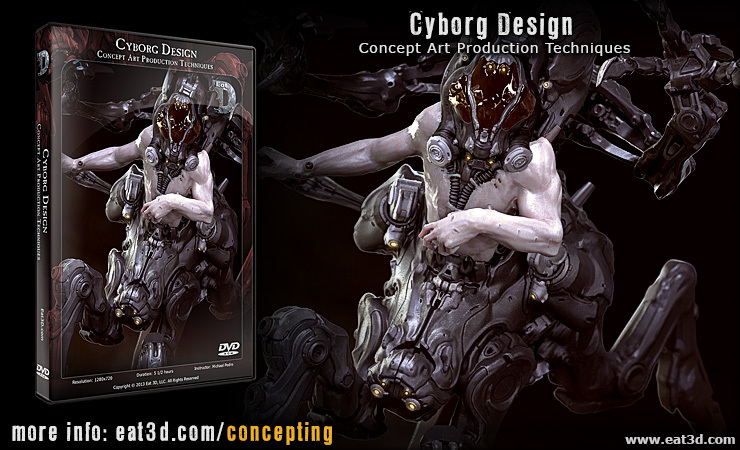 The bulk of this DVD will then focus on the development of the final design in ZBrush. He demonstrates how he makes use of insert meshes, kit-bashing, and character posing, in order to more quickly arrive at a presentable design. When completed, he imports the model into Keyshot where he applies various materials and sets up the lighting scenario. Finally, he takes the renders into Photoshop, where he makes the necessary tweaks and touch-ups for presentation. With over 5 1/2 hours of content, this DVD is perfect for those who are looking to integrate ZBrush into their character design pipeline. Michael Pedro has been working in the gaming industry for over 8 years with companies such as Electronic Arts, Sony Online Entertainment, and Certain Affinity. In that time, he has had the privilege of working on several high-profile projects including DC Universe Online and Halo 4. Michael began his career as an environment artist but was later given the opportunity to shift gears into full-time concept design. This has given him a certain advantage when it comes to the execution of design and presentation, as 3D has become the new staple of top-tier visual development. Eat 3D has been feeding your brain for 6 years with some of the highest quality training that exists. Our goal is to provide you with the best education and get straight to the point with practical real world exercises that professionals actively use in production.